Our freeware pick this is week is a system monitor and more. Everyone needs this program. Which would you rather have at your house? The highway patrol, the border patrol, or WinPatrol? If you answered highway patrol or border patrol, are you reading the right newsletter? You said WinPatrol didn’t you? Even if you didn’t know what it was, you knew it was a better choice than the others. Good! We’re getting somewhere! Let’s see. We’ve featured WinPatrol three times before. And, we’re featuring it again today. Why? Because version 2011 of WinPatrol is the best ever – it’s optimized for Windows 7 (32bit and 64bit) but it also plays nicely with Windows XP and Vista too. WinPatrol is one of the most outstanding programs of its kind – it’s really one-of-a-kind, and we think that WinPatrol is a tool that should be on everyone’s computer – and that includes yours. Why should it be on everyone’s computer? It’s simple. Because it performs a number of useful functions that are important. And sure, you might be able to do some of these functions by following some technophile’s long, arcane, geekspeak-filled tutorials, but what would take you literally hours to do, WinPatrol can do for you in seconds even nanoseconds, right EB? Time me…how many nanoseconds? Really? Ten? Great! The features of WinPatrol 2011 are just short of amazing (well maybe not even just short – they are amazing!). We particularly like the “Hidden Files” feature. No, these are not the same “hidden files and folders” that you can view with Windows. These are super-hidden files, files you wouldn’t normally know existed, unless you’re some sort of geeky wizard with a master’s degree in geekotech. Which none of us reading this (or writing this) are. Are we? NO! They (whoever ‘they’ are) say that a picture is worth a thousand words. If that were so then this newsletter would just be six or seven pictures and you folks wouldn’t be writing about how long this newsletter is. Just a few pictures. Sounds interesting. Maybe I will try that. Not! Wait! Yes I know I’m rambling again…let me get back to WinPatrol. In this case, a picture is worth at least two-hundred words. Take a look. 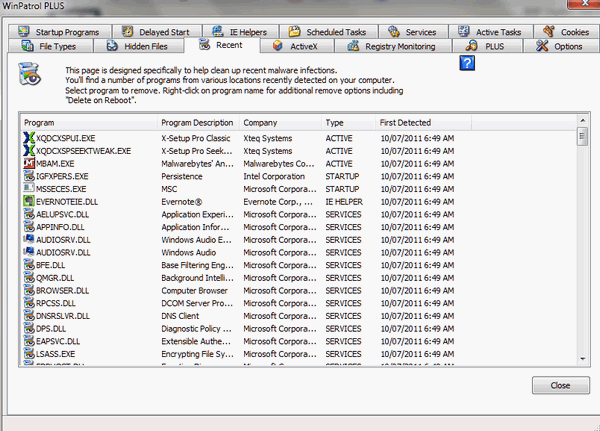 That, dear friends, is a screen shot of WinPatrol 2011. As you view the information below, glance back up here, and you’ll see how easy this program is to figure out and use. – Startup Programs. A basic foundation for great computer performance is reigning in and controlling the number of programs that start with Windows. If your computer is running slow, you have programs that crash, your computer freezes, or you have unexplained error messages which constantly harass you while you are using your computer: It could be adware or spyware, or too many programs starting with Windows (or all three) and burning up all your computer’s resources before the horse even gets out of the gate. Control the programs starting with Windows and – you’ll have more control over your computer – and your computer’s performance will improve! WinPatrol makes it snap to control programs which are starting with Windows. In fact, WinPatrol, does this better and easier than any other program we’ve ever tried. – Services are one of the most misunderstood aspects of Windows XP. Services are programs, folks. And not only are they programs, but they’re programs which start with Windows. Getting the picture? Don’t let the moniker “Services” throw you. Services are programs, they use memory, and the ones that are running in the background are burning memory. But wait! Some services are necessary for Windows to work? Which are necessary and which are not. Let WinPatrol help you decide. – IE Helpers – better known as “Browser Helper Objects”. These things have become much maligned because many are, in fact, spyware/adware applications running as Browser Help Objects or “IE Helpers”. But many BHO’s are helpful, some are great tools, and some are baddies that ruin your computer. WinPatrol lets you peer into the arcane realm of BHO’s and gives you insight into which ones you have installed. It’s a good place to check for spyware/adware too. WinPatrol makes it easy to see what’s going on. WinPatrol has many other helpful and useful features. Don’t believe me huh? Look up! Look at that toolbar array! How much more do you want? You want ice and water too? Really? Seriously, anything, any tip or trick, any program, any utility that makes using your computer better, easier, faster, safer and quicker is good. Right? WinPatrol does all of those things and more. Best of all WinPatrol’s free version is not crippled and useless. It’s functional and a pleasure to use. You shouldn’t be with out it. We shouldn’t be without it – and we’re not. We have it! And you should too! Are you getting the point yet? And besides all of the above, WinPatrol’s creator, Bill P. is a stand-up guy. He’s not running some huge corporate giant with little cogs churning out software applications by the dozens. Plus, Scotty, WinPatrol’s mascot, is a clever little doggie indeed. Wait ’til you meet him! Bill wants to speak, he’s the developer, so we must let him write a little blurb about his program, right? “You don’t have to be doing anything wrong on the Internet to become a casualty of malware. WinPatrol takes snapshot of your critical system resources and alerts you to any changes that may occur without your knowledge. WinPatrol was the pioneer in using a heuristic behavioral approach to detecting Zero-Day attacks and violations of your computing environment. WinPatrol continues to be the most powerful system monitor for its small memory footprint. So back to the business at hand — You can get WinPatrol’s free version (and learn more about it) by visiting this page. Once you try WinPatrol 2011, you’ll wonder what you ever did without it. And once you’ve used it for a while you’ll quickly see why it’s one program we always have on all our computers and one of our top-ten freeware picks of all time. Who in the world doesn’t like WinPatrol? What is the. different between you and WorldStart website? The difference between us and Worldstart is about the same as the difference between Apple and Microsoft. We have nothing to do with Worldstart. I have used winpatrol for years. I liked it so much I upgraded to the plus version. It is the best. I have used the Plus version for years. It has kept me out of a lot of trouble. The best thing IMHO is the start up program list. You wouldn’t believe what you have starting up and with WinPatrol you can get rid of a lot of programs that make your start up take forever. Do I need WinPatrol and Registry Commander? I have had WinPatrol for years. Love Scotty. Have the plus, it is GREAT. I, too, have had Win Patrol on my computer for years as suggested by you. It’s truly and amazing program and I wouldn’t think of being without it. It’s an amazing programme!